One Sunday afternoon, I was strolling down with family. After hours of window shopping and running errands, all I wanted to do was cap the day with a cold dessert. We know the mall inside out, given we grew up here — so when we saw this Instagrammable dessert place, we knew we just had to try it out! We’re from FAR-view and to be honest, I am so happy more options for food are popping up in our area. After much researching, I read that this was born out of a couple’s passion for delicious, dainty desserts, good value for money, and healthy eating. You can opt to create your own sweet treat, or go for their unique spins on classic desserts such as halo-halo, mango sago, and birthday cake. In all fairness, their desserts are pretty good - and you can see the amount of thought and effort to put together this concept while trying to be cost-friendly. 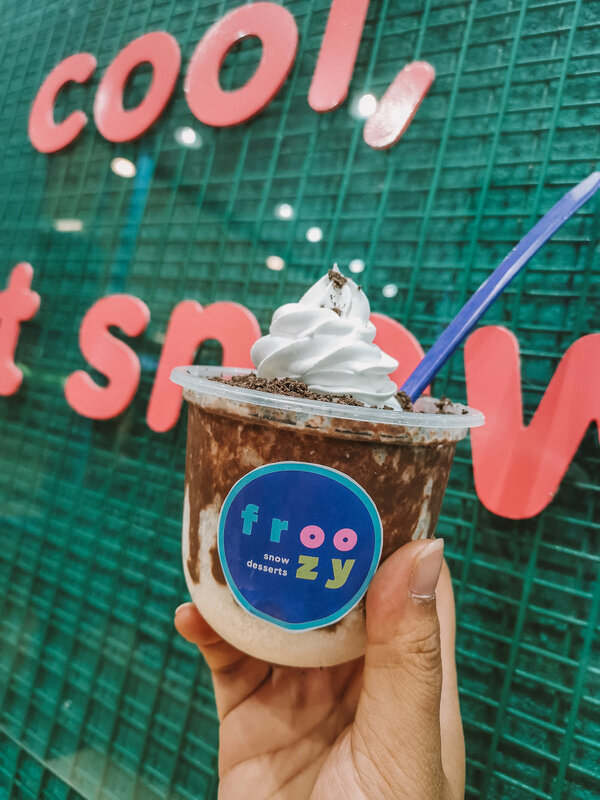 Froozy uses a flavored shaved snow which is very thin and different from a typical iced dessert. They’re really generous with the amount of toppings they include - which adds to the whole, positive experience of eating Froozy. Lastly, they try to make their desserts healthy by lowering the calories and sugar content compared to the normal desserts Filipinos love a.k.a. ice cream and yogurt. Froozy truly raises the bar and filipinos must give this a try!